Growing up a little boy in San Diego was magical. It was really only magical because of my grandpa Murray. He would take me and my cousin Tai to the beach almost every morning, but not before stopping by Dunkin’ Donuts where we each got our own donut and little carton of milk. He’d park the truck at Pacific Beach, then my cousin and I would hop out the back of the old, white Toyota and we’d plop onto the warm sand. My grandpa would unload the boogie boards, wetsuits and rash guards like he’d done hundreds of times as we’d scamper towards the ocean. I was slow in the water because, at first, the ocean terrified me. I was an average swimmer, but I never liked to go past the shallows. Rather, I would just dawdle on the shoreline, practically playing on damp sand. I remember my grandpa, board in hand, telling me that I’ll never get to ride a wave standing on the beach. He asked if I wanted to surf the waves with my cousin and I totally did, but I wanted to skip the leaving-shore part. He walked me into the water and we waded out until the surface was chest high. We pushed off the sea bottom, skimming across the water on our boards. The waves lapped up over my shoulders and I distinctly remember my heart racing and my breath quickening when I felt the bottom fall out of reach of my feet. The water got colder the further out we went and I watched my grandpa paddling away from me. The waves would break over my face, salty water stinging my eyes, after they opened my grandpa would be a bit further away. I tried catching up, thinking this must be what it’s like to be left at sea. I could hear him yelling at me to paddle hard and to keep paddling in order to stay on the board. Saying it’s going to be hard paddling through the breaks, but on the other side the swells are calm and that’s where we’ll stop paddling. I felt like I was paddling for an hour. We passed the break and my grandpa, my cousin and I floated there, resting on our boards. My grandpa taught us how to pick a wave and when the right wave came, he nudged us as the wave crested, propelling us towards the shore. It was a rush! I felt the pull of the ocean as I whooshed to shore. I couldn’t even stop laughing. I skidded to a stop on the sand and turned to see my grandpa in the water, hollering and cheering. I remember a big grin on my face from dimple to dimple. 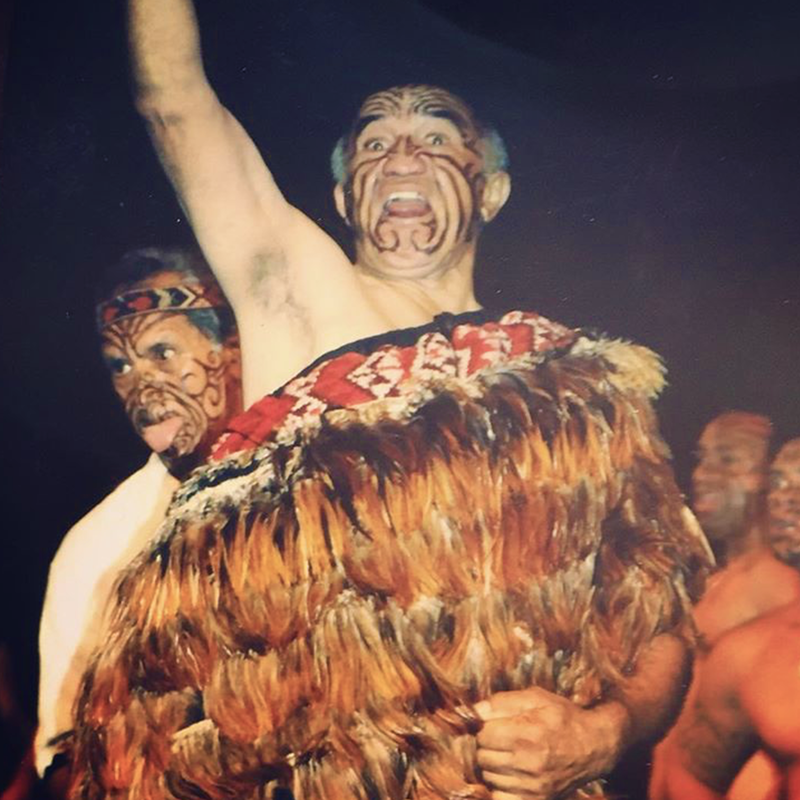 My grandpa in his traditional Māori cloak called KAHU. I learned so much, way more than I realized back then. I clearly see the lessons now, he was adding to my book of How to be a Man. You can only be rewarded after you make the decision to wade into the deep. You must learn to do things you don’t want to do. Once you begin your journey, the path will only become more difficult before they become easier. Once you’re past the breaks, you must learn to be patient, you have to wait for your moment. Once your moment comes, you go hard. Only then you get to enjoy the ride. Now, my grandpa is very sick. They say he doesn’t have much longer. He was the bishop of my church. He was a house-building, storytelling, hard-working behemoth. He wasn’t a perfect man, but he was the epitome of goodness. Still is. My dad was a running back for the Chicago Bears. He made it onto the team in ’86 after winning a National Championship title with BYU in ’84. He was an immigrant, but learned english, dominated the gridiron and he could drag defenses thirty yards down field. And I mean, the whole defense. My dad has calf muscles the size of footballs. Growing up, my thighs were the size of his forearms. He wasn’t afraid of anything, not even south-side Chicago. Boys always say “..my dad could beat up your dad..” I always believed it. The only time I saw him cry was when his mother died. He taught me how to be a man, taught me that men do cry. He taught me to look for opportunities to help people, not for excuses. From him, I learned how to work, how to fight for those who couldn’t. He taught me to be proud of who I am He taught me to be humble. My dad was my hero. Still is. My dad on a poster for BYU. 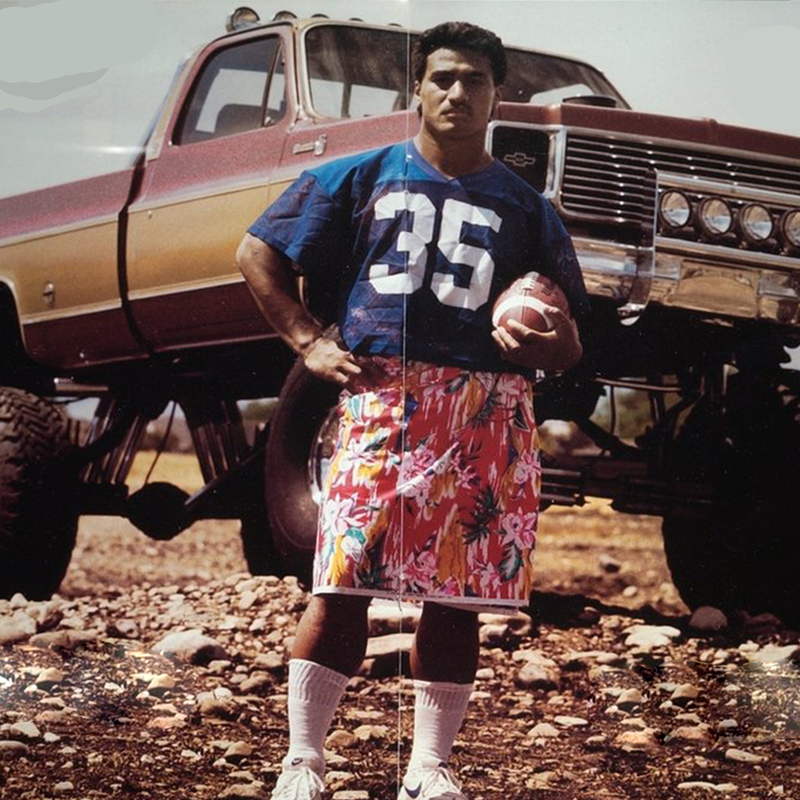 He was called the Turbo Tongan and I love how this image screams the 80's. A few months ago, my dad was diagnosed with rheumatoid arthritis. His muscles are always stiff and sore, his knee bones are literal mush. He’ll need them replaced eventually and hasn’t been back to work in a long time. He’s been in a wheelchair. You can see that it is so painful, even though he’ll never say so. Once he was in so much pain that he couldn’t move, he couldn’t stand — my mother had to carry him to bed. I don’t like to think about it. It’s harrowing to witness strong men struggle. It’s heartbreaking to watch as great men die. It’s harrowing to witness strong men struggle. It’s heartbreaking to watch as great men die. I hate getting older, more so because it means that the men in my life are getting older too. I sincerely hope that someday, I can be a hero to my kids and a grandpa Murray to my grandkids. It’s a bittersweet desire because the day that I do would mean that the men I looked up to will most likely have passed on. I’ve been married to my wife for seven years. I’ve known her and her family for about nine and I love them. She is the youngest of ten kids, they are the quintessential mormon family. Almost everyone went to BYU, almost everyone were missionaries. They make a mean Jell-O salad. My wife says that her family is really like two families within a family, the older five and the younger five. And smack in the middle, is Spencer. From left to right: My brothers-in-law Matt, Spencer and my son Hendrix. If I am writing a story about the strongest men I know, I would be remiss to exclude my sweet brother-in-law. 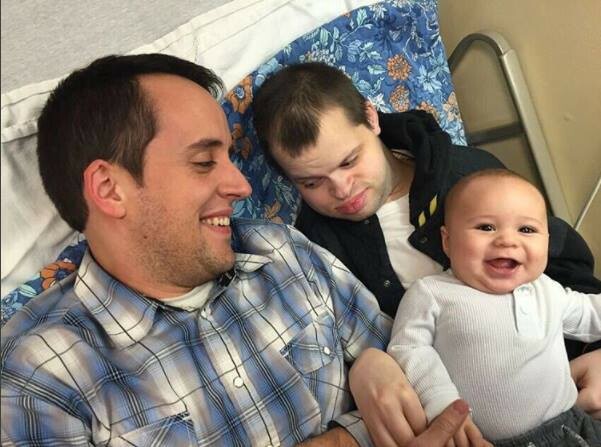 When Spencer was born, medicine was bygone, so birthing complications led to cerebral palsy. He came to this world with severe handicap and the doctors said that he wouldn’t live to see his eighteenth birthday. Although he couldn’t speak or walk or stand, he was as sharp as he was gentle. He was loving and kind…he was just so, pure. He also needed care all the time. His parents and siblings loved him unconditionally, and his mother cared for him his whole life with his family helping whenever, however they could. It was real work. I learned that the more-than-three decades of careful work and labor were not actually for his benefit, but for ours. In an eternal perspective, we needed him a lot more than he needed us. When you truly serve others, you learn how to love. And Spencer’s life mission was to provide our family with a lifetime opportunity of service, he was a man who taught us how to love. The capacity to love, in every life he touched, multiplied. The world needs more men like him. He passed away yesterday morning. He was unconquerable, even with death at the doorstep. Only when his sister Sarah made it to his bedside from Colorado, did he acquiesce. Spencer had a matchless, pure and indomitable spirit. I’m grateful for the moments I shared with these men and I wanted to share them with you. Because lately I’ve been getting that feeling that I felt when I was younger, like I’m being left behind at sea again. EDIT (08/01/17): Spencer passed away May 16, 2017 and my grandfather, Thomas passed away two months later, July 18, 2017.